Beef stew, there must be thousands of recipes for this hearty dish and Rustic Italian Vegetable Beef Stew is just one of them. Every family in every country seems to have a version of beef stew. 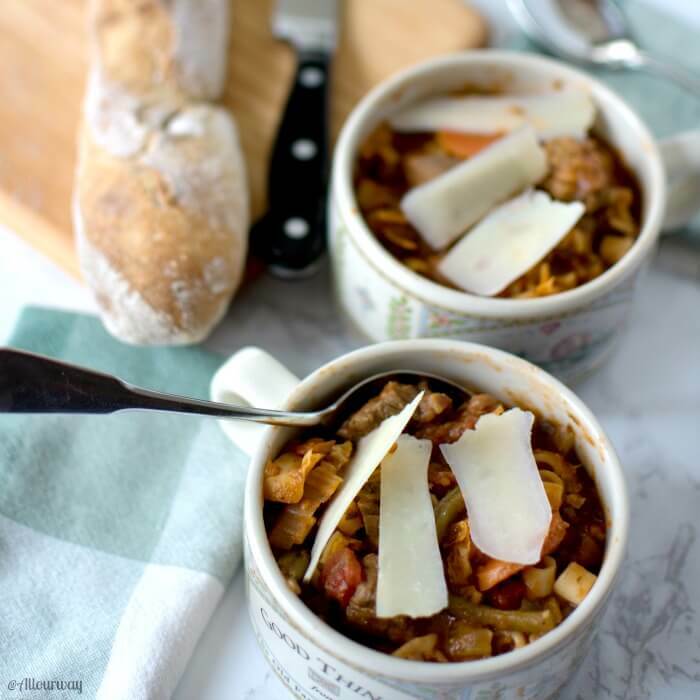 Our Rustic Italian Vegetable Beef Stew contains lean meat, nourishing vegetables, creamy Pinto beans, and ditalini pasta all in a rich tomato broth. Think of a big pot of hot aromatic thick vegetable beef soup on the stove, waiting to welcome you and your family in from the cold. Our stew features cabbage instead of potatoes but you may add potatoes to your beef stew if you like, use venison meat, or make it vegetarian. We know you’ll love this stew. For this recipe, you’ll need: beef, cabbage, onion, celery, carrots, green beans, garlic, diced tomatoes, tomato sauce, pinto beans, beef broth, bay leaves, parsley flakes, oregano, basil, red pepper flakes, olive oil, salt, pepper, small pasta. To call a dish beef stew, it has to cook in a pot with a liquid base, and it must have beef as the main ingredient. Stewing meat, as a method of cooking, goes as far back as the discovery of fire. As the caveman leaves the cave, he’s mumbling about ungrateful wives. The woman, in the meantime, looks at the bloody mass on the ground. She’s grumbling about leathery meat. With a sigh of resignation, she grabs the container of water then rinses off the dirt and grass from the hunk of flesh. What should she do? She looks at her water-filled cauldron; she looks at the meat at her feet. Why not she thinks to herself? A hot soak in water couldn’t hurt the tough meat. She smiles to herself as she puts a big chunk of meat into the simmering water. Today this delicious comfort food comes in many forms. It can be . . .
Italian Spezzatino di Manzo, and more. Now that most homes have a slow cooker or crock-pot, it’s even easier to whip up a delicious beef stew any day of the week. We don’t have to spend hours in the kitchen tending the stew on the stove, the slow cooker does the work. The only thing that we would do if using a slow cooker instead of a Dutch oven, is lightly sauté the meat first. Then we would sauté the onion, celery, carrots, garlic, and green beans and proceed with the rest of the recipe. We made our Rustic Italian Vegetable Beef Stew in our Dutch oven. Smelling a wonderful stew simmering on the stove is so homey and enticing, no scented candle can ever match that smell. This stew is versatile. You can use chicken or even make it vegan by eliminating the meat and adding more beans for the protein. If you like, add more broth and make it into Vegetable Beef Soup. 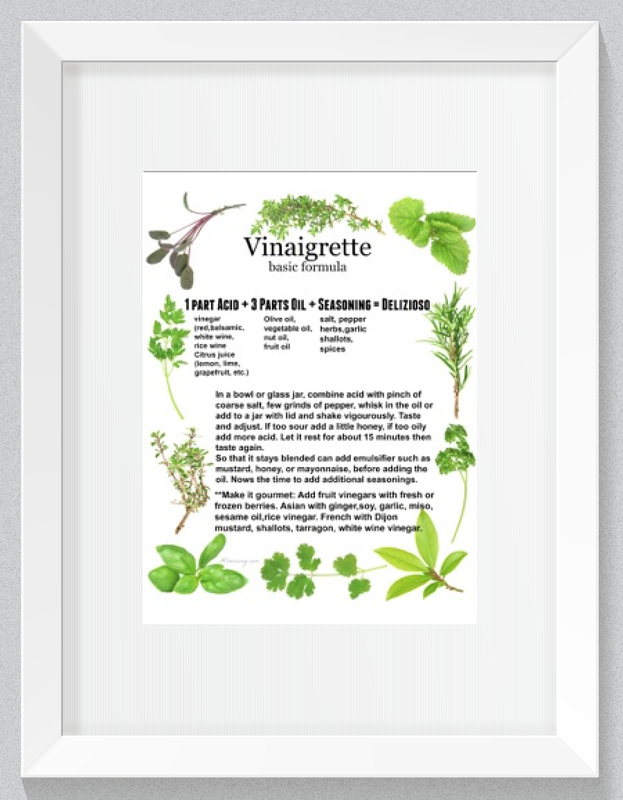 Italian seasoning — oregano, basil, parsley leaves. bay leaves. spice — black pepper, red pepper flakes. soffritto — onion, celery, carrots. These seasonings aren’t etched in stone. They are just some of our favorites. However you make it, we know you’ll be happy with the taste. We’re already planning our next vegetable beef stew, although this time, we may make it a venison stew. Be sure to sign up for our newsletter, we enjoy sharing with you what we’re cooking up in our kitchen. Here’s a video of another soup you may like. Thank you very much for being a part of All Our Way! This hearty and tasty stew is very versatile and satisfying. You can make it thick as a stew or thin as a soup. It’s all up to you. Whichever way you make it, you will be happy with the taste and seasoning. Guaranteed!! 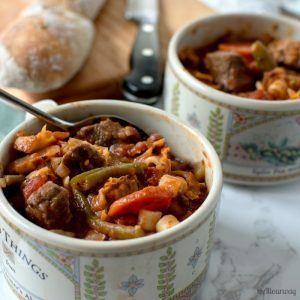 A hearty spicy vegetable beef stew that's loaded with iron-rich beef, nutritious vegetables, high fiber pinto beans, comforting pasta, all in a rich tomato broth. Excellent any time of year but especially so in the cold winter months. 3/4 cup dried ditalini may substitute any small pasta cooked to under al dente. It will finish cooking in stew. Place a Dutch oven or large pot on medium high heat sauté beef in 1 1/2 tablespoons olive oil for 5 minutes, stirring occasionally. Lightly salt and pepper the meat as it sautés. Remove meat with juices and set aside. In the same pot add the rest of the olive oil and sauté the onion, celery, carrots, garlic, green beans, seasonings over medium-high heat until the carrots and green beans are semi-soft. Add beef broth, beef cubes and juice,diced tomatoes, tomato sauce and bring to a boil then turn down to simmer. Cover with lid and continue to simmer until meat is tender about 1 hour. Stir in the drained beans and the savoy cabbage. Place the lid back on the pot and continue to cook for another 15 minutes. Check the meat for doneness. The beef should be tender. Stir in the cooked ditalini, cover the pot with lid, turn off the heat and let it rest. If you prefer a thinner stew, add more beef broth. Serve with shaved Parmesan cheese. This is a very versatile stew. Add your favorite vegetables. This recipe can be a starting point. Add more liquid if you like it thinner. We thought it was excellent as is. Your cut of meat will determine the cooking time. Taste as you go along. Thank you, Dee! You’re such a sweet friend. 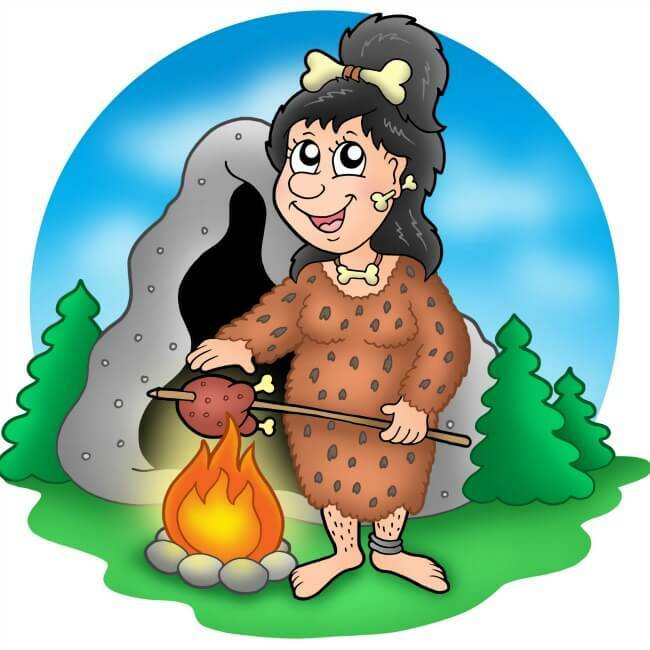 the caveman cartoons crack me up 😀 This beef stew looks delicious, saved and pinned! I like the history behind the beef stew, You made it delicious with beef and veggies and made whole some. Love it. Great for busy weekdays. Stew is always a hit here in the fall and this sounds very hearty. I love ditalini in soup but haven’t tried it in stew. Yum! A good beef stew with plenty of veggies is one of my all-time favorite comfort foods. I think this is one of those dishes that is always even better the following day. Perfect cold weather food and a great way to feed the whole house! This is so cute that you wrote about stew’s history. 🙂 It is so interesting to know more about culinary history! And your beef stew look so inviting! I need to buy the ingredients! Stew is my first most favorite comfort food and stew loaded with vegetables is absolutely delicious! With cold weather this stew will warm tummy and soul. So good! Beef Stew is one of my favorites – love the big chunks of meat and veggies – yum! Now that looks like comfort food in a bowl. Love stews this time of the year and this sounds perfect with all that goodness. My kids would feast over this one Marisa. So hearty and wholesome. Wow and wow, this is so delicious and it makes my mouth watering. I want to try this recipe for dinner. I think that my family will like it. Hi, Dan! It certainly is very tasty!! 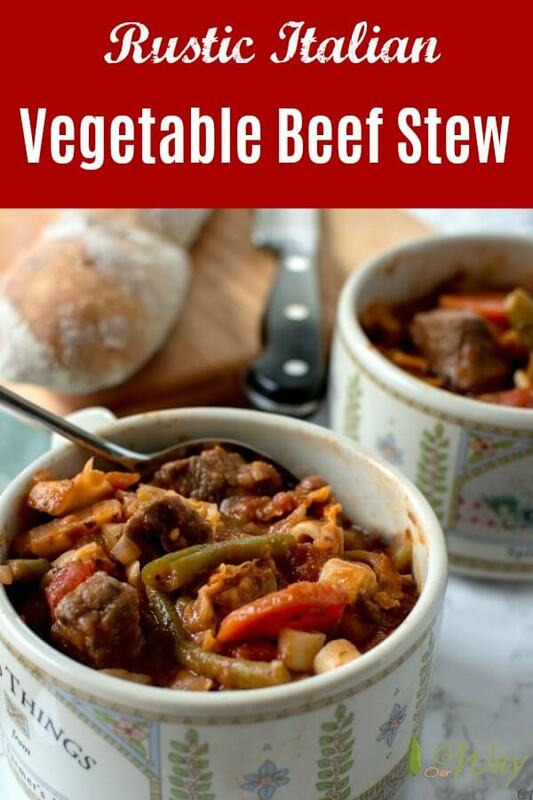 This tasty, easy and colorful vegetable beef stew is calling my name! I was always a fan of comfort food and I am pinning this recipe for later! I love stew! It was a staple back when I got my first apartment many, many years ago. I don’t put in as many ingredients as you do so I can’t wait to try your version. It looks so hearty and delicious! Great post! We love a good beef stew. Especially my dad. He can eat beef stew all day everyday (though I’m sure he shouldn’t lol!). This looks so delicious. I love stew and don’t make it nearly often enough. This version looks so good and hearty! When it comes to comfort food season….I look for food in bowls. Love wrapping my hands around a warm bowl of goodness. I love stew, and this looks delicious. When I make stew at home, I make a HUGE batch. I love the leftovers, and my kids and grandkids always want to take some home. I have just been starting to look for some great stew recipes for fall and wow this one is a keeper and must make! I sure your family will enjoy it, Claudia. Have a great weekend. We love a hearty stew in our family, thank you for the new recipe! I’ll be adding it to our meal plan next week. Hello, Alexis! I think stew is a great dish any time of year – our family loves it. This is my kind of dinner recipe! So yummy and perfect for my entire family. They would love this beef stew! Hi, Christine! If you make a big pot, it’s great reheated!! Great for a busy family. Well the calendar says SPRING…but the weather outside is an ICE STORM (for 2 days now). This is the perfect comfort food…and it will go with the wine to drown our weather headache. You can NEVER go wrong with a delicious bowl of stew and fresh baked bread for dinner any night of the week. With comfort food season just around the corner, this looks totally delicious. When I make stew…I usually end up making a HUGE batch. Some for us, some for the freezer (hopefully)…and some for my daughter!! Hehe! 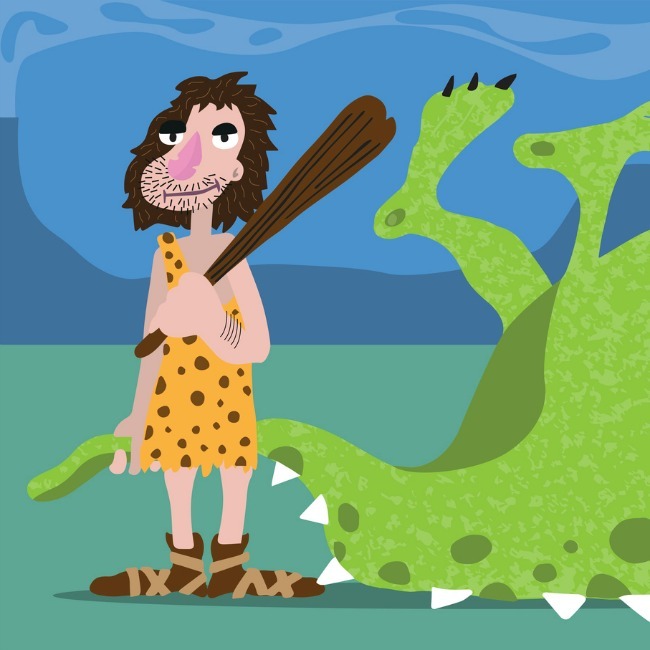 I love your caveman story and illustrations! Made me laugh! I love a good beef stew and you are right, there are tons of them out there. 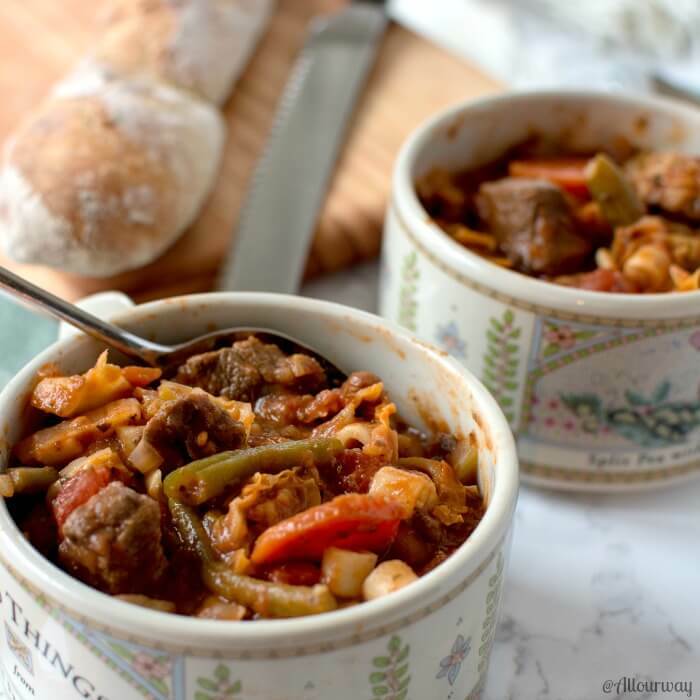 I really tend to like beef stews like yours….. chunky, hearty, and rustic. This one looks absolutely delicious! Oh my goodness this sounds AMAZING! The perfect comfort food. I’ve just come back from a hill walk where I got hailed on in gale force winds, and I could seriously use a bowlful of this as I defrost! Hello, Elizabeth! Wish I could pop some in the mail and send it to you. We are ready to make our second batch – it’s cold here too. Hope you’ve defrosted – have a Merry Christmas. A good beef stew is always so comforting on a cold winter day. Time to head to the store for ingredients before i get snowed in. Hi, Linda! Your neck of the woods gets a heck of a lot colder weather than we do. Stay warm and have a very Merry Christmas! Abbracci! Oh I love a hearty stew! And this one looks scrumptious :)…and love the cartoons! Thank you, Heather! I enjoy writing the stories. Have a Merry Christmas. Oh Marisa that’s a fantastic story hahaha. I love making up origin stories for dishes too, it’s always fun to wonder things like ‘How did people decide that eating eggs, or drinking milk was a good idea? 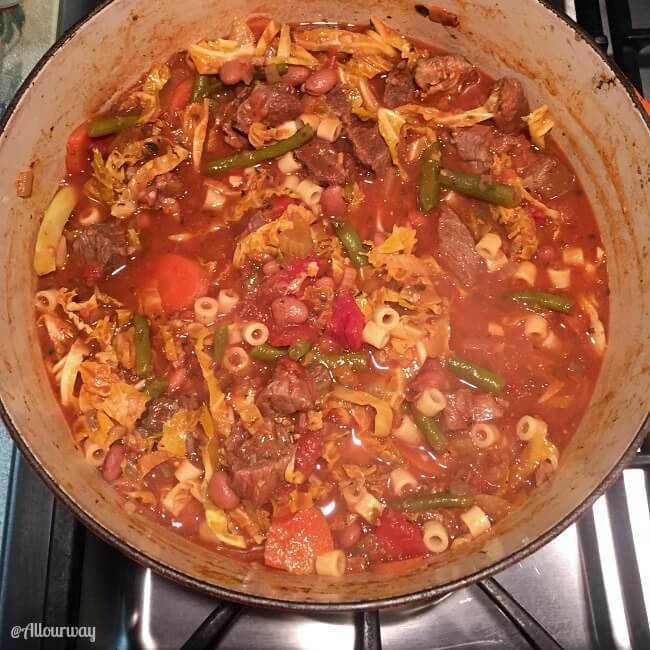 ?’ Love your beef stew, it looks absolutely gorgeous, and any stew with pasta always has my vote! Hi! I’m glad you enjoyed the story. It’s like you guys going around the world finding recipes and then making them. They all have stories, don’t they? lovely post Marisa, this beef looks so delicious !I wish you a Merry Christmas, un abbraccio ! Buon Natale, Chiara! The stew was delicious. I was raised on soups and stews. Brings back great memories. Un abbraccio forte? This really does look like the perfect comfort food! Delicious! Hi, Emily! It is so good and versatile too. I always enjoy a hot bowl of beef stew. Sometimes it’s hard to get beef around here. We use beef shank for goulash and ragout in general because it’s best suited for longer cooking periods and it doesn’t get chewy and yet gives flavor. I love posts like this where you get to learn a bit more about the history and art of cooking! I love beef stew as much as the next person and your take on it looks fab! Hi, Emma! Thank you. I am always curious about how recipes start adds so much knowing something about it. Hi, Ross! I think it’s cold everywhere! Make some beef stew and warm up from the inside out 🙂 Sometimes you have to really search to find different pasta. I’m a sucker for something new and unusual. Hope you’re having a wonderful Christmas season. Perfect timing. It is cold here in the south today and beef stew would be very warming. Your recipe looks fantastic. Thank you, Jovina. I guess we better make up a big batch when we head south! Hopefully it will start warming up soon.